Former President Obama gave away the store, including $1.7 billion in cash, in a desperate, narcissistic attempt to create a legacy with the 2015 Iran nuclear deal. 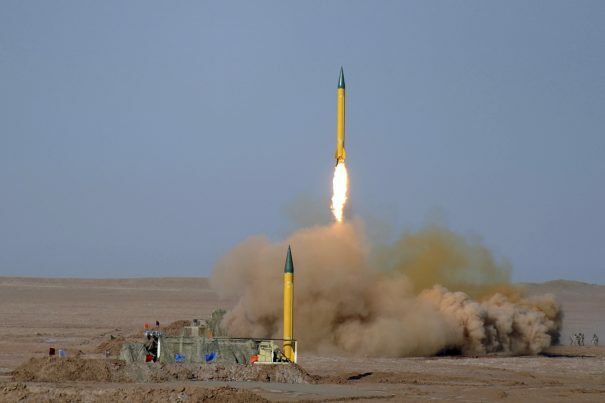 Iran is nonetheless moving forward with a long-range missile program, and late last month it unveiled the Khorramshahr ballistic missile at a military parade in Tehran that commemorated the 36th anniversary of the Iran-Iraq war. The missile supposedly has a range of approximately 1200 miles and contains a warhead weighing 4,000 lbs. ZeroHedge reported that the Iranian regime continues its defiant posture. [President] Rouhani addressed [the September 22] parade in Tehran, noting that Tehran would not halt its missile program and would continue to boost military capabilities, despite US threats to scrap the landmark 2015 agreement that capped Iran’s nuclear activities in return for the lifting of international sanctions on Iran. Shortly after Rouhani’s remarks, Iran released footage of the test firing of the missile from an unspecified location. President Rouhani has insisted, however, that his country is not seeking to develop nukes, but that it doesn’t need permission to enhance its military defenses. Rouhani also assailed President Trump as a “rogue newcomer” looking for an excuse to withdraw from the deal. The danger posed to the world by the Tehran regime’s nuclear ambitions and its bankrolling of terrorists again calls into question why the Bush administration launched an invasion to depose Iraqi dictator and Iran foe Saddam Hussein, thereby allowing Iran to vastly increase its sway in the region. Moreover, spineless Republicans and Democrats should have insisted that Obama submit the Iran deal to the U.S. Senate as a treaty requiring an up or down vote and a two-thirds majority for approval. Parenthetically, $400 million of the cash that Obama sent to Iran was in the form of ransom for the release of four U.S. prisoners held there. Former U.S. Secretary of State John Kerry admitted last year that some of the cash the Obama administration sent to Iran would likely fund terrorist activityy. According to what insiders told the Washington Free Beacon, President Trump has concluded that the Iran deal is finished. The Trump administration is expected to announce next week that it will not formally certify Iran as in compliance with the landmark nuclear agreement, a move that could kill the agreement and set the stage for Congress to reimpose harsh economic sanctions on the Islamic Republic…it has become increasingly clear the president is frustrated with Iran’s continued tests of ballistic missile technology and rogue operations targeting U.S. forces in the region, according to these sources. In the narrative that Rhodes shaped, the “story” of the Iran deal began in 2013, when a “moderate” faction inside the Iranian regime led by Hassan Rouhani beat regime “hard-liners” in an election and then began to pursue a policy of “openness,” which included a newfound willingness to negotiate the dismantling of its illicit nuclear-weapons program. The Times described this selling job by Rhodes and Obama as “actively misleading,” however. … [T]he most meaningful part of the negotiations with Iran had begun in mid-2012, many months before Rouhani and the “moderate” camp were chosen in an election among candidates handpicked by Iran’s supreme leader, the Ayatollah Ali Khamenei. The idea that there was a new reality in Iran was politically useful to the Obama administration. The U.S. State Department still considers Iran a state sponsor of terrorism.